Process Benefits - ExSyM - Exelus Inc. Recent technological advances, specifically the confluence of horizontal drilling and hydraulic fracturing, have enabled vast gas reserves locked in shale formations to be cost effectively tapped for the first time. The ability to access these resources has led to a sudden decoupling of the traditional link between petroleum and natural gas prices. Converting methane (the largest component of natural gas) to methanol is a well-established method for monetizing methane. Recent R&D has focused on converting methanol into the desired light olefin products such as ethylene, propylene and butenes via the methanol to olefin (MTO) process or to Benzene, Toluene and Xylenes (BTX) via the Methanol to aromatics (MTA) process. The ExFlex process combines mixed butanes, and methanol over a unique solid-acid catalyst to generate light olefins (ethylene, propylene and butenes) and BTX with over 90% selectivity. The exotherm of the methanol to olefins reaction is matched by the endotherm of the iso-butane to olefins dehydrogenation reaction. Stable catalyst performance allows the reaction to be carried out in an adiabatic fixed bed reactor. 1) Adiabatic operation: The exothermic heat of reaction for the methanol to olefins reaction is exactly matched by the endothermic heat of reaction for isobutane to olefins/BTX. 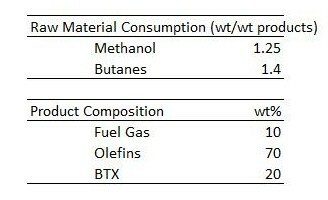 3) By co-reacting cheap mixed butanes with a more expensive methanol feed, the overall raw material costs are nearly cut by half. 4) The solid-acid used in the Exelus process has mild acid sites, greatly reducing catalyst deactivation and significantly increasing run lengths to > 1 day.